Iceland is an island hot-spot built up by abnormally high volcanic activity on the North Atlantic mid-ocean ridge probably resulting from a mantle plume that detached from the Earth’s outer core/mantle boundary millions of years ago. 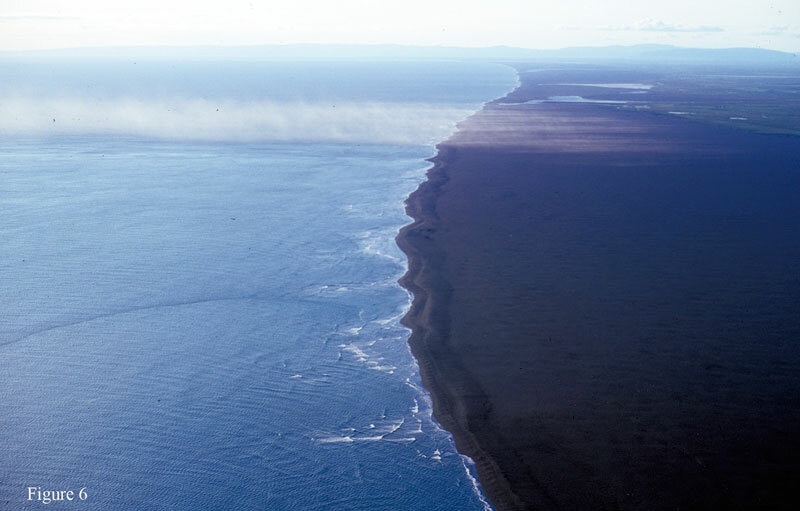 Two mid-Cenozoic basaltic volcanic zones (upper ocean crust) are separated by a neo-volcanic spreading center offset by a transform fault system. This neo-volcanic zone (subaerial portion of the mid-ocean ride) supports frequently occurring volcanic eruptions. During the Pleistocene glacial events, most of Iceland was covered with a single, large ice sheet. During the modern interglacial period, bedrock is mostly exposed except for a number of small ice sheets, and the 150 km wide Vatnajokull ice sheet (“jokull” is Icelandic for glacier), which covers the active spreading center and the Grimsvotn Volcano as well as other volcanoes and hot springs. The Vatnajokull is one the Earth’s remaining ice sheets left over from the Last Glacial Maximum coming in a distant third in size as compared to Antarctic (1st) and Greenland (2nd). Iceland has experienced isostatic uplift as a result of late Pleistocene ice sheet loss. The 75 km long south-central coast of Iceland (Figs. 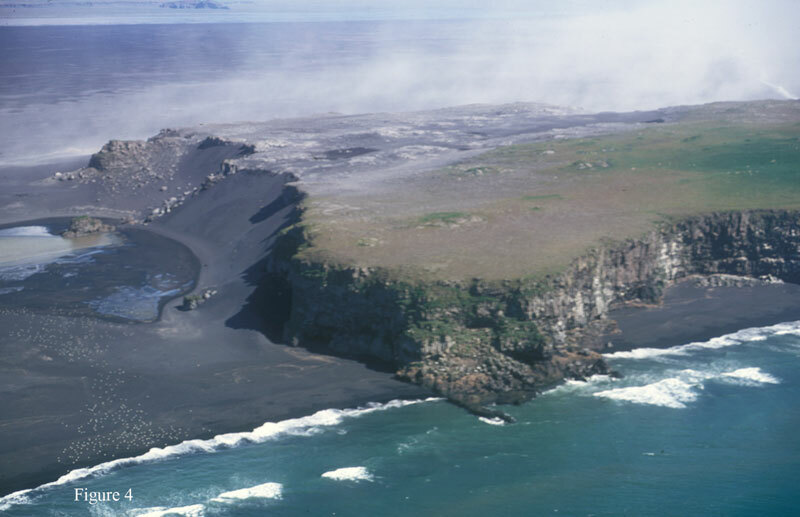 1, 2; See photo gallery above), anchored to the east by a basaltic rock headland (Ingolshofdi) and a point arbitrarily chosen to the west marked by the Skaftaros Lighthouse fronts a broad glacial, alluvial outwash plain, called a “sandur” (Icelandic for glacial outwash plain). This is a fan delta dominated by braided streams emanating from a large 25 km wide piedmont glacier—the Skeidararjokull. The 75 km wide and 100 m thick Seidararsandur formed from meltwater from the Skeidararjokull over the past 11 ky. The meltwater has been derived from three sources (1) normal summer runoff, (2) glaciogenic “jokulhaups” (Icelandic for glacial bursts—short term, but very large water discharge floods) from rapidly discharging ice-margin glacial lakes, and (3) volcanogenic jokulhaups from sub-ice volcanic activity beneath the Vatnajokull. The largest jokulhaups cause glacial streams having water discharges of ~400 m3/sec to increase to ~100,000 m3/sec, but lasting only for a few days or weeks. For a comparison the average discharge of the Amazon River is 170,000 m3/sec. The jokulhaups associated with the Skeidararjokull are normally in the 40,000-50,000 m3/sec. The jokulhaups (probable the glaciogeneic type) are becoming more frequent as the Skeidararjokull ice margin retreats (~20 m/yr) due to global warming (Fig. 3). The sediments produced and released are mostly black obsidian and basaltic gravel and sand-sized fragments. The upper fan is dominated by gravel and the lower fan and coastal system consists of medium sand with median grain sizes ranging from 0.4 to 1.0 mm. 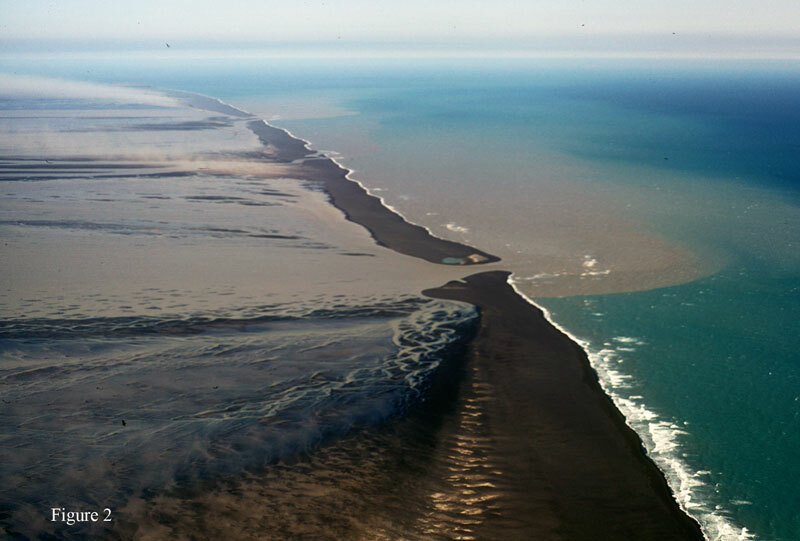 The sediment discharge to the coast by each glacial burst (31 glacial bursts from the year 1389 to 1971) equals the sediment discharge 70-80 years of one year’s normal summer meltwater. So, sediment input is catastrophic allowing the coastline to prograde as much as 4 km in a matter of weeks when these events occur. Iceland is located between the Arctic and Polar Fronts which generate huge and powerful winter extratropical cyclones —the waves from which particularly impact the south facing coastline. Dominant wave power (13.75 x 1010 ergs /m/s) for December 1972 (December most extratropical cyclones/yr) was from the SE thus setting up a westerly longshore transport along the Skeidararsandur coastline. For the time frame Nov-Feb 1972, there were 62 storms having wind strength >Beaufort scale 10 (55-63 mph or 24.5-28.4 m/s). The wave power from the SW is an order of magnitude smaller. Wave hindcasting techniques have calculated significant wave heights of 14 m. Nearby wave gauges have measured wave height of 11 meters during these extratropical events. The spring tidal range is 2 m thus making this coastline to be classified as mesotidal even though it lacks many of the classic mesotidal geomorphic features found on sedimentary coastlines—the wave power and sediment input from the glaciers overwhelm the tidal range influence. The 4 km rapid coastal progradation mentioned above due to large jokulhaups erodes back quickly by this large wave energy flux to create a more stable coastline examined over longer time scales. 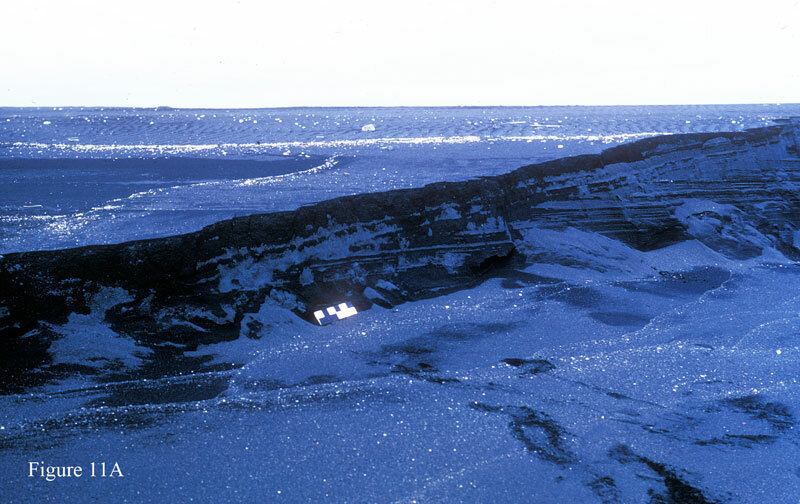 This highly dynamical coastal system involving very high sediment input during the summer and particularly the frequent jokulhaup events and the enormous high wave energy events in the winter have maintained a relatively stable shoreline that has prograded only 1.1 km during the past 300 years. At the eastern basaltic bedrock anchor Ingolfshofdi, the shore has been mostly invariant (Fig. 4). Down towards the Skaftaros Lighthouse 75 km to the west, the coastline has prograded 3 km in 300 years due to the net westerly longshore transport. The high wave energy has created an extremely deep and steep shoreface that extends to 75 m deep closure depth ~4 km offshore having a gradient of 1:38. This shoreface supports a series of inshore bars having 5 m relief and crest in 7 m water depth. Beyond the shoreface, the inner shelf gradient decreases to about 1:170. In comparison, typical shorefaces off the eastern US have slopes of 1:200 decreasing to inner shelf gradients of ~1:2000. 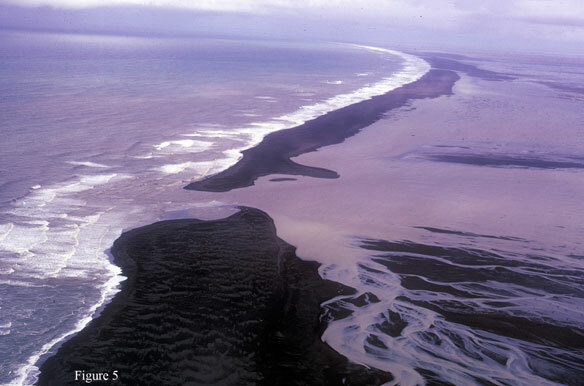 This 75 km coastline presents two different depositional models: (1) barrier spits backed by active braided streams, and (2) barrier spits backed by wind-tidal flats (Figs 5, 6). Barrier spits are elevated berms capped by eolian dunes. The eolian facies is dominated by unvegetated, transverse wind driven bedforms (transverse dunes). These wind-blown bedforms features active slipfaces when winds blow >20 kts persistently from generally east in summer for several days (Fig. 7). 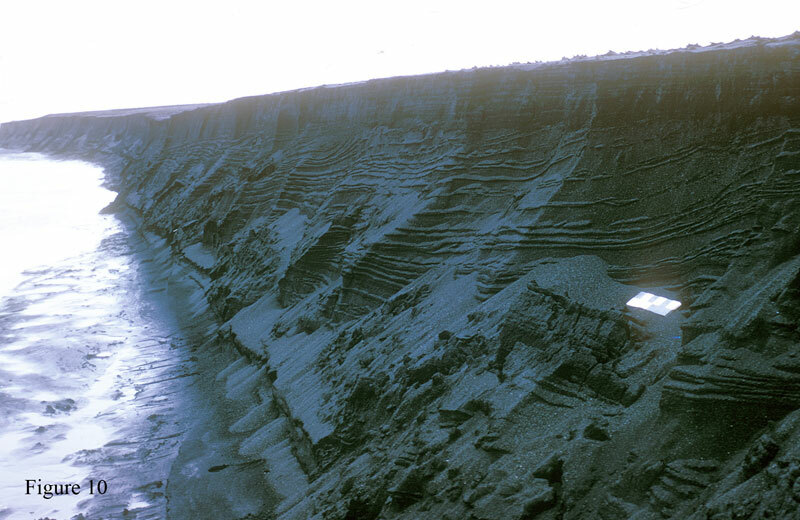 The bedform spacings range from 10-80m and height ranges from 0.1 to 2 m. These bedforms, built on top of the storm berm lack plants due to constant wind transport and the severe storm urge overwash—particularly in the winter. These eolian bedforms merge into fluvial bedforms along the backside of the barrier spit. 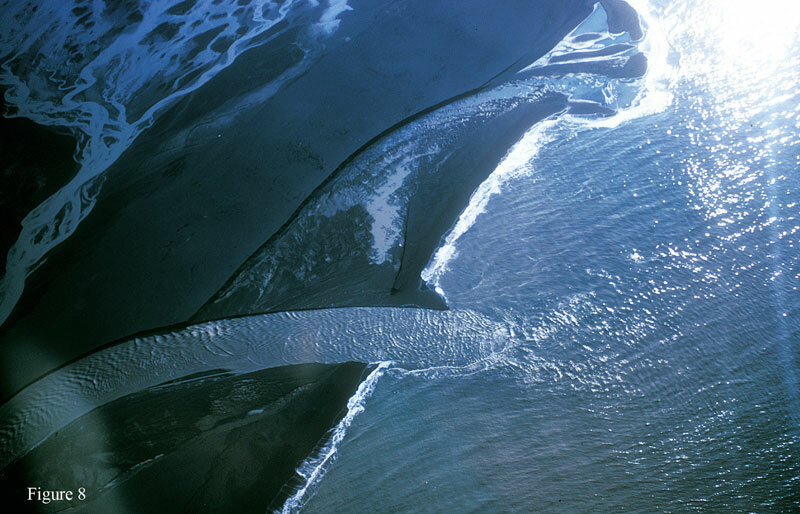 The barrier spits are backed by (1) elevated braided streams or (2) wind-tidal flats preventing the back barrier spits from being flooded by seawater—there are no marine lagoons along the Skeidararsandur barrier spit coastline. Glacial meltwater from the braided streams reach the elevated barrier spits, flow laterally along their backside until a river distributary (Fig. 8), is cut through the barrier spit. The lack of accommodation space for tidal lagoons was due to braided stream and wind-tidal flat aggradation and perhaps due to isostatic rebound as noted earlier. At the river distributaries, the meltwater is confined in narrow channels and flows directly to the North Atlantic Ocean. Regardless of tidal stage, flow seaward is not reversed but the seaward-directed flow velocity is reduced during high tides (~250 cm/sec at low tide reduced to ~60 cm/sec at high tide). Sediment discharge through the river distributaries under normal summer meltwater conditions also changes tidally—3.7 g/l at low tide—high seaward flow to 1.1 g/l at high tide–lower seaward flow. Occasionally, the entering, heavily sediment laden, glacial meltwater is hyperpycnal, particularly during the jokulhaups, such that that density underflows on the inner shelf are developed. The length of the barrier spits is defined by the presence of these river distributaries. Extensive fragmentation of the barrier spits occurs during glacial burst events (Fig. 3). 1. Located along the eastern part of the 75 km long Skeidararsandur barrier spit coastline (Fig. 1). 2. Underlain by fluvial facies formed by lateral migration of more common river distributary channels. River distributaries form 1-2 m high scarps as distributary migrates laterally (Fig. 10). 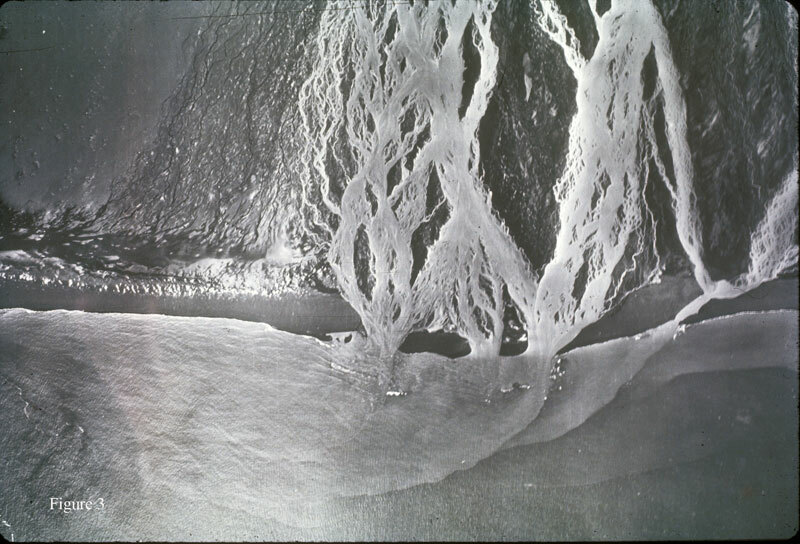 Braided stream activity more common along the eastern Skeidararsandur than western portion in 1972 when the study was conducted. 3. 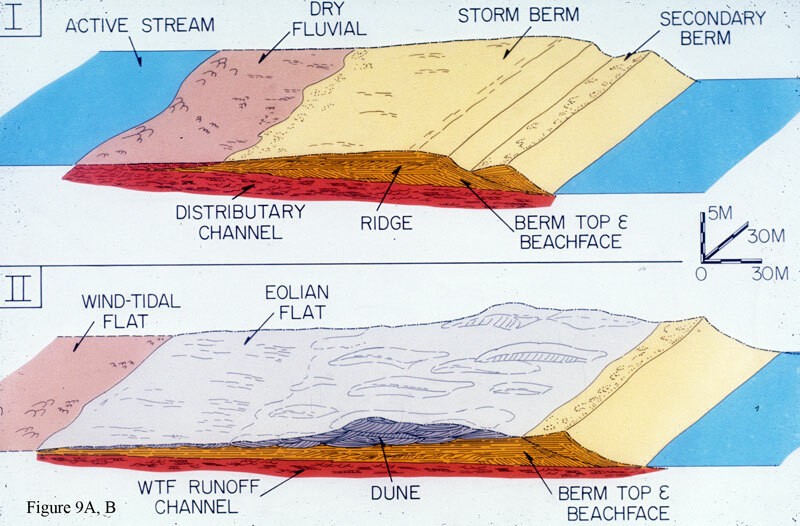 Berm top and beach face stratification overlies fluvial facies due to frequent overwash during storms and during spring high tides (Fig. 11A, B). Intertidal swash bars and berm ridges common forming landward dipping cross-stratification. 4. Eolian bedforms (unvegetated transverse dunes) cap berm top overwash-generated plane laminations. 5. The fluvial, berm, and eolian succession forms to elevated topography that defines the barrier spit. Behind the spit braided streams commonly flow laterally until the breach or distributary in barrier spit is located. Eolian transverse dunes merge laterally landward into braided stream bedforms and linguoid bars. 1. 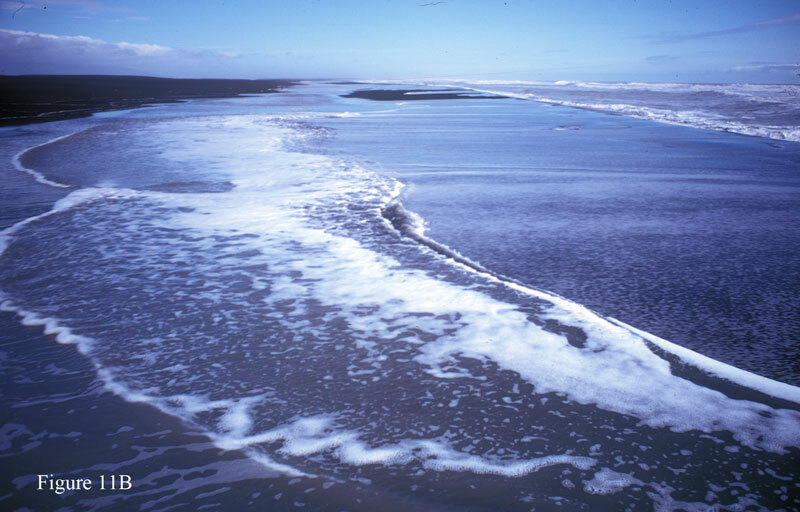 Located along the western portion of the Skeidararsandur barrier spit coastline. 2. Wider and higher due to absence of migrating river distributaries and lower frequency of jokulhaups. 3. Underlain by fluvial facies. 4. Also well-developed berm capped by eolian transverse dunes. 5. Back portion of spits grade into broad wind tidal flats, not braided streams, which become flooded during elevated wind events. 1. Icelandic spits are underlain by fluvial not overwash, migrating tidal inlet, back barrier or lagoonal facies as are barrier islands. 2. 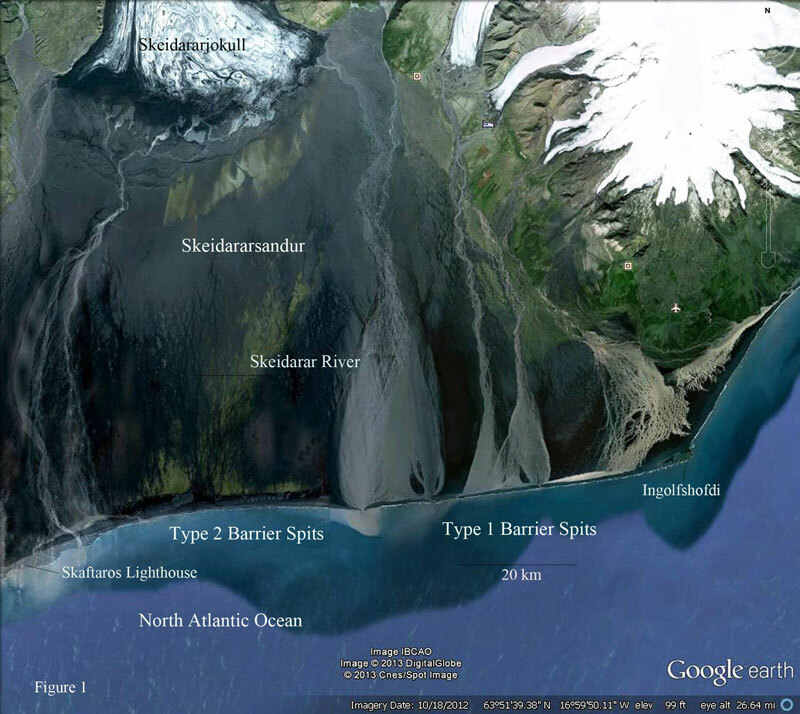 Icelandic spits have no well-vegetated foredune ridge, maritime forest, or back barrier marsh. 3. Icelandic spits if not destroyed would be buried by jokulhaup flood deposits from behind. 4. Mulitple berm growth (aggradational and progradational ) seems much more prevalent along Icelandic spits than many barrier islands. Hine, A.C., and Boothroyd, J.C., 1978, Morphology, processes, and recent sedimentary history of a glacial-outwash plain shoreline, southern Iceland: Journal of Sedimentary Petrology, v. 48, no. 3. P. 901-920. Nummedal, D., Hine, A.C., Ward, L.G., Hayes, M.O., Boothroyd, J.C., Stephen, M. F., and Hubbard, D.K., 1974, Recent migrations of the Skeidararsandur shoreline, southeast Iceland:Final Report for Contract No. N60921-73-C-0258; Naval Ordnance Laboratory, Panama City, FL. Nummedal, D., Hine, A.C., and Boothroyd, J.C., 1987, Holocene evolution of the south-central coast of Iceland, in, Fitzgerald, D.M., and Rosen, P.R., (eds. ), Glaciated Coasts: New York, Academic Press, p. 115-150.